Wang EW, Vandergrift WA 3rd, Schlosser RJ. Spontaneous CSF leaks. Otolaryngol Clin North Am. 2011 Aug;44(4):845-56. Wang EW, Gullung JL, Schlosser RJ. Modified endoscopic medial maxillectomy for recalcitrant chronic maxillary sinusitis. Int Forum Allergy Rhinol. 2011 Nov;1(6):493-7. Dedhia RC, Desai SS, Smith KJ, Lee S, Schaitkin BM, Snyderman CH, Wang EW. Cost-effectiveness of endoscopic sphenopalatine artery ligation versus nasal packing as first-line treatment for posterior epistaxis. Int Forum Allergy Rhinol. 2013 Jul;3(7):563-6. Choby GW, Mattos JL, Hughes MA, Fernandez-Miranda JC, Gardner PA, Snyderman CH, Wang EW. Delayed nasoseptal flaps for endoscopic skull base reconstruction: proof of concept and evaluation of outcomes. Otolaryngol Head Neck Surg. 2015 Feb;152(2):255-9.
de Almeida JR, Su SY, Koutourousiou M, Vaz Guimaraes Filho F, Fernandez-Miranda JC, Wang EW, Gardner PA, Snyderman CH. Endonasal endoscopic surgery for squamous cell carcinoma of the sinonasal cavities and skull base: Oncologic outcomes based on treatment strategy and tumor etiology. Head Neck. 2015 Aug;37(8):1163-9.
de Almeida JR, Carvalho F, Vaz Guimaraes FIlho F, Kiehl TR, Koutourousiou M, Su S, Vescan AD, Witterick IJ, Zadeh G, Wang EW, Fernandez-Miranda JC, Gardner PA, Gentili F, Snyderman CH. Comparison of endoscopic endonasal and bifrontal craniotomy approaches for olfactory groove meningiomas: A matched pair analysis of outcomes and frontal lobe changes on MRI. J Clin Neurosci. 2015 Nov;22(11):1733-41. Patel CR, Fernandez-Miranda JC, Wang WH, Wang EW. Skull base anatomy. Otolaryngol Clin North Am. 2016 Feb;49(1):9-20. View Dr. Wang's most current publications. Dr. Wang’s clinical and research focus are in the areas of skull base surgery and rhinology, his areas of subspecialty fellowship training. As a member of the UPMC Center for Cranial Base Surgery, he has designed and implemented multiple prospective controlled trials on the outcomes and consequences of skull base surgery. In addition to outcomes research, he also is active in translational research. 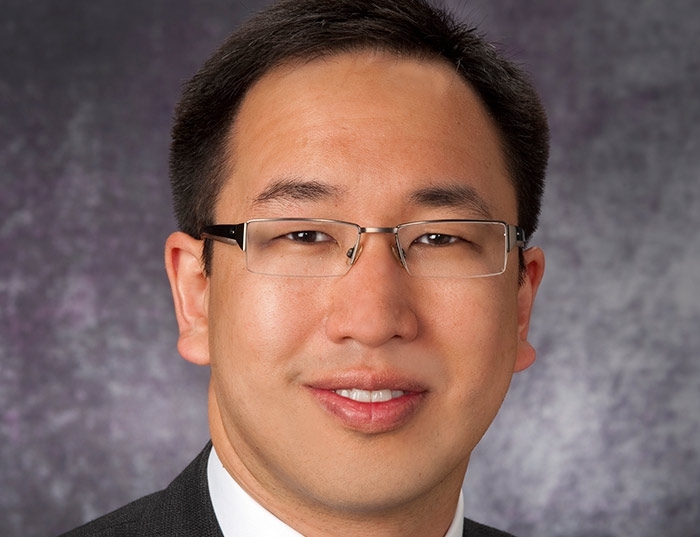 Through exome sequencing and mutation analysis, Dr. Wang aims to determine molecular targets for the adjuvant treatment of clival chordoma, a locally aggressive malignancy of the skull base and an area of clinical expertise at the UPMC. He is the site lead investigator for a national multi-institutional prospective trial on sinonasal malignancies. His second primary area of investigation is the microbiome of the paranasal sinus and its implications in chronic inflammatory rhinosinusitis. Through collaborations within rhinology and pulmonology, the role of viruses and bacteria in maintaining inflammatory homeostasis and reflecting pro-inflammatory disease states within the sinonasal mucosa is under active investigation.